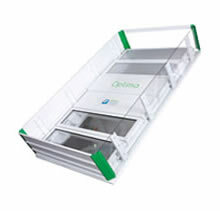 Designed to specifically to lead the smoke ventilation market with excellent air / water tightness and insulation properties, the Optima offers the best ‘U’-value currently available for a louvred smoke ventilator anywhere on the market. The Optima delivers a remarkable performance. The system is both extremely watertight and airtight, achieving high insulation values from 1.0 W/(m2-K). The Optima is the most environmentally-friendly louvred ventilator on the market. Manufactured from 80% recycled aluminium the Optima offers an optimum contribution to the fire safety, comfort and energy management of a property and is perfect for use in sustainable buildings.